You can either make excuses or you can make success happen. 🚗 Running late because of a flat tire? 🚕 Running late because your ride is late? 📞 Can’t get a hold of who you’re meeting? Blame them for not being available. Instead, own the circumstances and charge ahead. This morning I got a flat tire on the way to an 8:15 am appointment. I could call my wife, but I didn’t want to overwhelm her with getting three kids ready on short notice and have her take on any anxiety because of my time crunch. So I called an Uber. I looked on the app. Now a 5 minute ETA, again? He was still driving… in the wrong direction. I messaged him what shop I was in front of. He replied. In a way, I think? By canceling the ride. Great. Now it’s 8:15, my meeting time, and I still don’t have a ride. I had a pre-business hours appointment. The only reasonable option is to find a solution. Literally, what benefit is there to any other option other than finding a solution? Grabbed the next Uber, got there just 10 minutes late. They were late, too, and didn’t even notice. Started “right on time,” calm and collected, because I didn’t get stressed. Killed it. 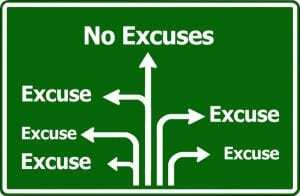 No one but you cares what your excuses are.